Tibetan towns in China’s southwestern Sichuan Province are severely suffering from the advancing decay of even the most basic infrastructure. Even though residents report these problems to local authorities, the latter generally fail to do something about it for lack of political will to improve the Tibetans’ living conditions. Kharnya Township in Draggo County, a small village with a population of only 400 families, is particularly affected by governmental neglect, with poorly-maintained roads and an insufficient power supply being only the tip of the iceberg. Facing increasingly hazardous conditions caused by decaying infrastructure, the residents of an impoverished Tibetan town in southwestern China’s Sichuan province are pleading with local authorities to repair crumbling roads and a badly maintained power station, according to a local source. 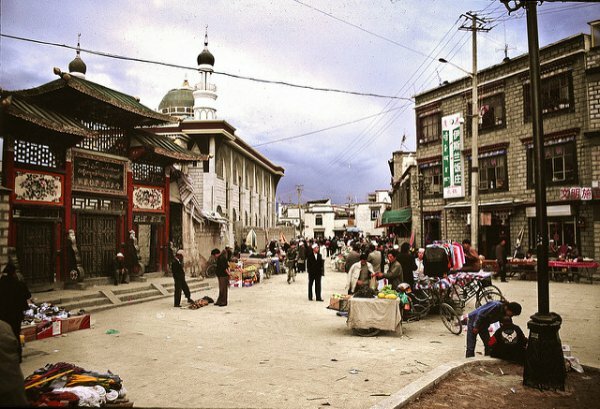 Kharnya township in Draggo (in Chinese, Luhuo) county in the Kardze (Ganzi) Tibetan Autonomous Prefecture has suffered for years from dangerous roads and an unreliable and unsafe power supply, prompting residents to petition township officials for help, a local resident told RFA’s Tibetan Service. “A similar petition was presented to authorities last year but was ignored,” RFA’s source said, speaking on condition of anonymity. “The main issue now is the lack of proper roads in Kharnya on which local residents can travel and conduct economic activities in the town,” the source said. “Traffic on the town’s main road is often halted by erosion and the frequent landslides caused by poor construction work,” he said. And though an electric power station was built in the area about 10 years ago, the station is not well maintained, and the local residents get hardly any benefit from it." Instead, power lines left lying in the open have caused occasional and sometimes fatal accidents, he said. Deforestation initiated by local authorities has also damaged the local environment, RFA’s source said, adding that the “random cutting and transportation” of timber in and around Kharnya has also resulted in injuries. “The authorities have not provided any kind of compensation for these victims of government neglect in the area,” he said. Lying about 80 miles from the Draggo county seat, Kharnya is home to about 400 families, but owing to poor road conditions in the area, no teacher can be persuaded to remain in the township to teach, the source said. “Thus, there are now no students in the school,” he said. Chinese security forces swarmed Draggo in large numbers two years ago in an apparent attempt to prevent county residents from observing the anniversary of a violent crackdown on Tibetan protesters in January 2012. Two Tibetans were killed, and at least 30 injured, in the incident in which armed police fired at random into a crowd, sources said in earlier reports. Shopkeepers in the county have since been ordered by authorities to hand over all stocks of photos of exiled spiritual leader the Dalai Lama, with “severe punishment” threatened for those who fail to comply.